This section of RV Across America (.net) highlights superior RV accessories from mattresses to road service to water filters (and everything inbetween!) that you’re going to NEED (ok, or want!) – all of which I have personal experience with as an “end user” and have found to be superior as a full time traveler who has put these products to the ULTIMATE TEST! IF you’re a winter camper… I also highlight a heated water hose & heat tape (for the sewer line) to make your winter camping experience even better! This water hose really doesn’t kink! And… I like the fitting on the end that attaches to the hydrant – it makes it easy to twist the hose on tight so there’s no leaks. I recommend the 50 ft. length – I’ve never needed more, but I’ve come close! With this length of hose, you’re not going to have to worry “am I close enough to the hydrant” when deciding exactly where to set up camp in your site. Water pressure regulators are VITAL as many RV parks have variable or HIGH water pressure – pressure high enough to damage your RV’s plumbing system. What you DON’T need is an expensive or fancy pressure regulator – what you DO need is one that “does the job” AND has a filter on it to filter out solids – solids that will drive your hot water heater and inside faucets crazy and gum them up. This is an invaluable little fitting that works GREAT especially if you have a 5th wheel trailer (or motorhome) with a “wet bay”. It will help you attach the water hose AND guide it in the right direction! Reduces stress on both the hose and the fitting you’re connecting it to in that wet bay. A water filter is important for multiple reasons – the most obvious is to provide the inside of your camper with clean water, but there is more to the picture. Campground water systems are notorious for having sediment in the water. This sediment, when it enters your camper can act to gum up the faucets and collect in the hot water heater – which can ultimately cause the hot water heater to need service or more. Camco makes a reliable product, its often priced right (when compared to the competition) and they stand behind it. This sewer hose is a “universal fit” so if you need additional 10 ft segments (recommended to have a total of 30 ft “just incase”) – they will easily connect to what you’re getting here. This “see thru” connection to your sewer hose system connects at the sewer pipe. It allows you to insure that things are “flowing” and you can see when your black tank is REALLY clean if your RV has a black tank flush! Simple and invaluable. “Because it will” – Yes, your black & grey valves WILL likely leak at some point – and there is nothing more GROSS than removing your sewer cap and having THAT liquid flow out when you’re not expecting it. This tool INSURES you receive NO surprises when you remove your sewer cap! It truly is money well spent. Just twist it onto your sewer pipe, leave it there, and ONLY open it AFTER you’ve connected the sewer hose at your campsite. A sewer hose caddy is nice to keep your sewer hose off the ground and more importantly to insure that things “flow downhill”. If your hose is on the ground and the RV Parks sewer cap is elevated a few inches (this is common), without a sewer caddy, you’ll find that certain “things” don’t want to flow uphill – YUCH! Prevent your sewer hose from freezing up! I use this product as it is easy to wrap the tape around the sewer hose. Can also be used for water hose (if you don’t have the PREFERRED solution detailed above – a heated hose.) This comes in various lengths – but – I’ve always found 15 ft to be sufficient. 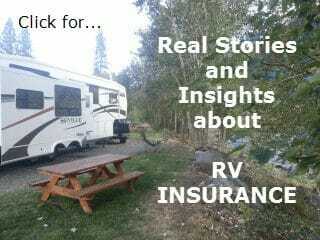 At this price, RV Digest-It may seem expensive – its not. You’re looking at 64 tank loads (its a 128 oz. bottle)! Simply put, this stuff works and its about as economical a solution as you’ll find. AND – its environmentally friendly. When it comes to surge protectors – this is NOT a place to cut corners! 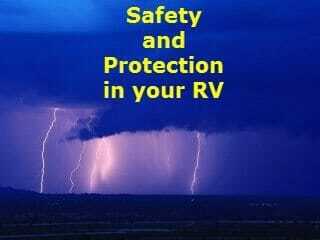 All it takes is ONE electric surge from sloppy RV Park electrical wiring OR from lightning and your RV’s electrical system & electronics ARE TOAST. And… good luck claiming it as warranty! No manufacturer will stand behind that damage. 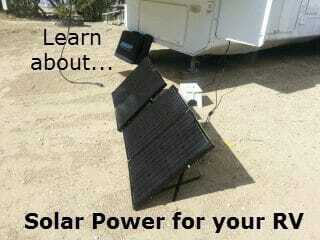 The bottom line: I would NEVER plug into a RV Power Pestle without having my surge protector inline. Progressive surge protectors are NOT cheap, but there’s a reason! When it comes to surge protection, you NEED the best. If your RV is 50A, get the 50A, if you pull up to a 30A site, you can use a 50 to 30A adapter with your surge protector. If your camper is 30A, get the 30A model. I’ve had my Progressive for 6+ years now – it has worked flawlessly and I’ve NEVER (knock wood) had a surge issue! Progressive is THE name in this arena.So that this page does not become too large, click HERE (link is not yet active) to get to MORE accessories. Safe to say however that what you see above is KEY to what you really NEED for your RV.Important Note: If you have a 50A system, you will likely run into some campgrounds with power pedastles that offer only 30A service. This connector is what you’ll need. It has a male 30A plug (which plugs into the power pedastle) and a female 50A plug which plugs into the 50A surge protector. What I like about this particular connector is the fact that it is designed to make it easier to disconnect it from the protector and the pedastle – note the handles on each plug. When it comes to generators – I purchased one recently mostly to insure my batteries remained strong during a dry camping stay. Frankly, solar panels, while they are GREAT, are of limited use in cloudy weather – and with the recent reduction in the cost of good generators, I decided it was worth the expense. The generator I’m going to recommend cost me well under $500. Here is a link to the best price I’ve found. If you stay for prolonged periods in cold weather, this bubble wrap will significantly increase the degree of insulation you have with your windows – and light can still enter your camper! I’ve seen other approaches with (perhaps) better insulators, but the tradeoff is your camper becomes a dark cave. 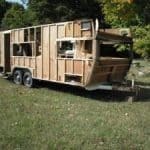 There is MUCH more to come here – I will LINK HERE to a 2nd page for ADDITIONAL things you MAY want for your RV. Safe to say, what you find above on this page are my BEST picks and 99% of all RV’ers need most if not all of these RV Accessories. Note: The above Amazon links are tied to an associate account that I have with them. By using my links, you’re helping me to fund RV Across America and the costs associated with maintaining a website like this. There is NO additional cost to you by using any of these links. You are (of course) free to purchase from any vendor using any link of your choice. I often suggest Amazon whenever possible simply because they are reliable and often offer the best price – and shipping is free if you have Amazon Prime.